InsuredPet.net offers helpful advice for pet owners to keep their animals healthy during the summer season. Our pets or more than that they are part of the family. We want to make sure that our pets are healthy and summertime can be difficult with that. Summer can often mean a lot of health problems with pets, dehydration, burnt paws, heat exhaustion, and much more. 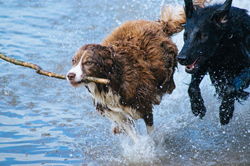 To keep pets in good health, the company InsuredPet.net has provided people with some simple tips to make their animal happy and healthy in the summer heat of 2016. InsuredPet.net is a company dedicated to the health and well-being of all animals. The company is known for providing unbiased reviews, tips, and information about pet health and pet insurance providers to help owners get exactly what they need from these companies. Many look to the site as a source for people, who are new to pet insurance, learn the basics and make educated decisions about the company and package that is best for their pets. The team at InsuredPet.net has spoken with vets and animal owners alike to provide a list of the most common pet health issues related to the summer heat. Burnt Paws- This is probably the biggest issue facing pets and the summer heat. Owners don’t think about how hot the sidewalk is or they assume their pet’s paw pads are protective. The fact is that if it’s too hot for a person’s bare foot, then it’s too hot for a pet’s paws. A simple solution is to invest in pet shoes or wait until it gets cooler outside, like at night. Dehydration- The pet isn’t going to think about dehydration so it’s up to the owner. Before planning a walk or a trip to the park, make sure the animal has already had plenty to drink, bring water to the location, and always make sure the animal has water after the trip as well. Since people generally have spare time, they will typically go out more. This leads to an increase in lost or stolen animals. Owners can either implant a chip or use a GPS collar to track the pet in these instances. Vickerson hopes that more people will be cautious this summer and look into pet healthcare insurance to help with otherwise costly medical procedures, treatments, and medications on InsuredPet.net.